I don’t always bake. Sometimes I like to make big messes that don’t involve flour! 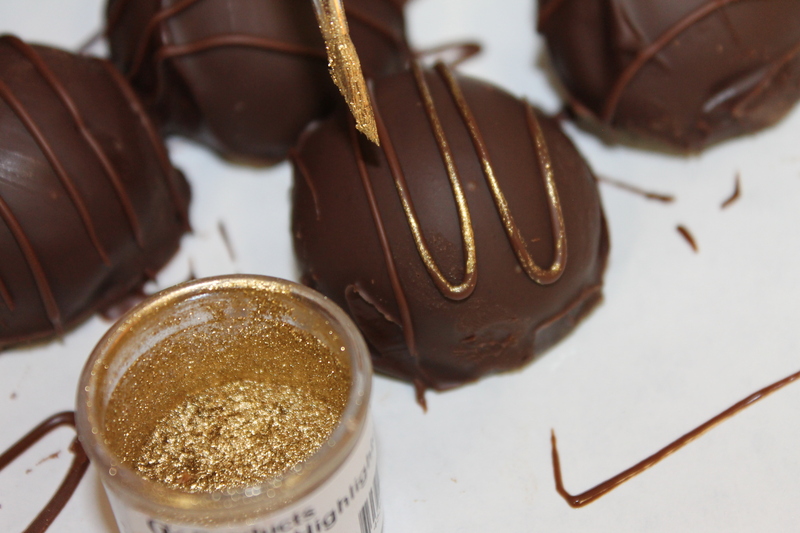 A truffle is basically glorified ganache, enhanced with lots of butter. That’s what makes it melt on your tongue, with the satisfying taste of rich chocolate. 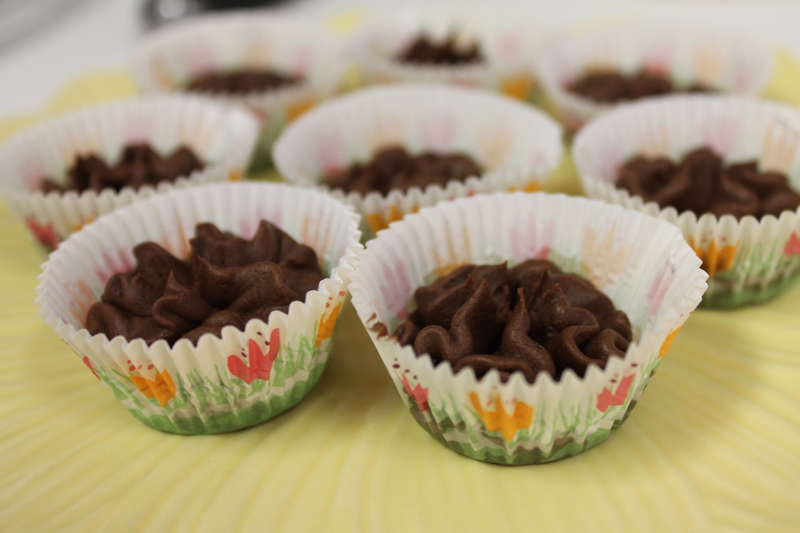 I made truffles last night and tried dipping them, molding them, and piping them. By far the easiest method was piping. You can pipe them, let them set, and then roll them in powdered sugar or cocoa for an easy and impressive treat, but I added a bit of peppermint extract to a third of the mixture and then piped it into mini cupcake liners. After chilling in the refrigerator, they popped right out of the liners and into my mouth – a perfect Frango mint. Dipping the truffle in melted chocolate. 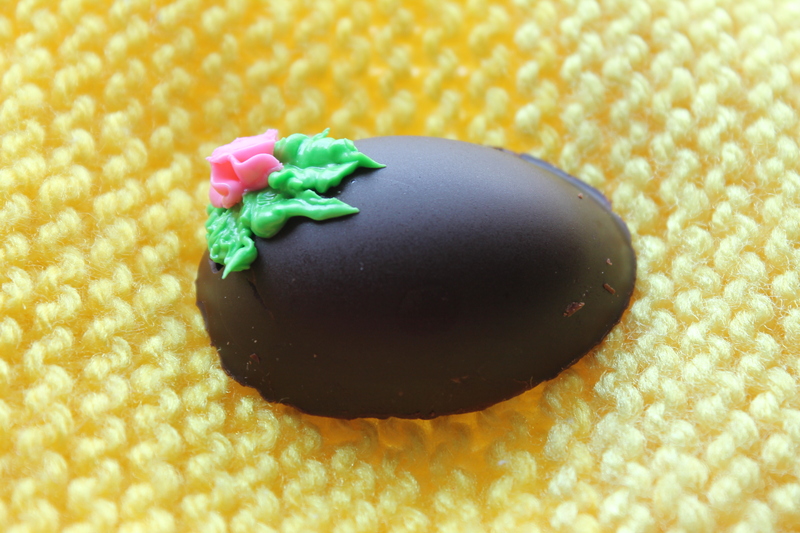 I wanted to make a truffle-filled chocolate egg for Easter. It would have been fine if I’d used a plastic chocolate mold, but I was too lazy to go dig through the Easter decorations (and no, for the first time in 40 years I didn’t decorate the house this Easter. I promise it will never happen again) so I tried to get away with a metal mold. Huh uh…don’t do it! 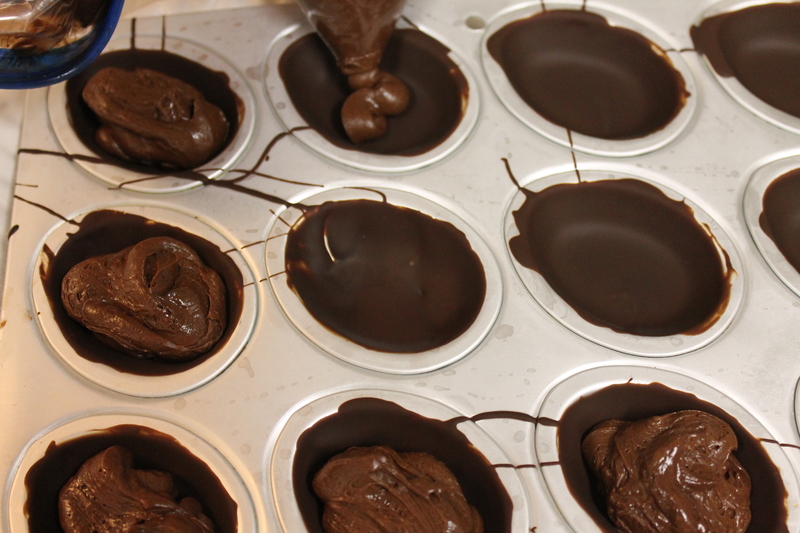 Fill the molds ALMOST full – then top with melted chocolate. Chill. It should have been simple: paint the mold with melted chocolate, chill, fill the centers with truffle mixture, cover with more chocolate, and chill again. When the molds are turned over, the eggs plop out on the counter, ready to be decorated. Mine didn’t plop. Here’s ONE that turned out nicely. A truffle filled Easter Egg. It takes a lot of chocolate and two sticks of butter for this recipe, but you won’t regret making these! If you prefer not to use the Kahlua, just add 3 more tablespoons of cream. Put the cream, sugar, Kahlua, and espresso powder in a medium pan and bring to a boil. Stir in the corn syrup and remove from the heat. 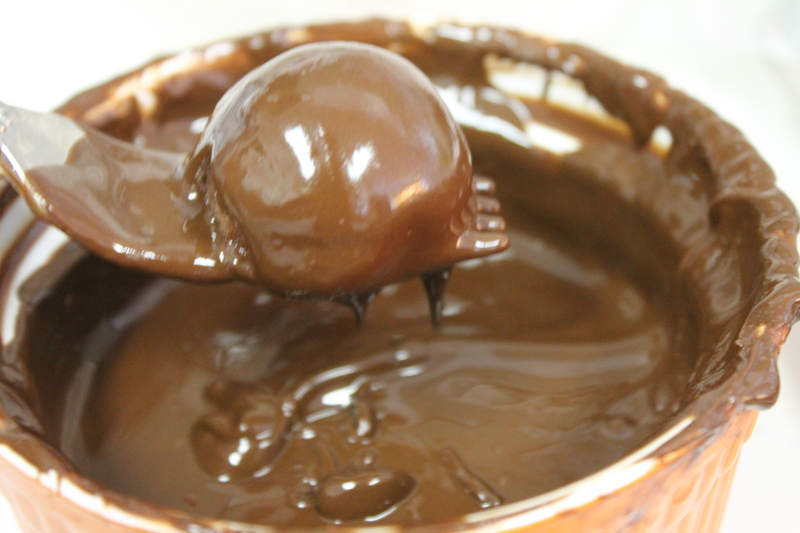 Add the finely chopped chocolate in about 5 additions, stirring gently each time, until all of the chocolate is melted. Set aside to cool. In a large bowl, whip the butter well. When the chocolate is the same temperature as the butter (don't get impatient here; this is critical...warm chocolate will melt the butter) gradually stir the chocolate into the butter, mixing well. At this point you may pipe the mixture onto waxed paper, or let it set a bit for molding and dipping. Now I’m going to go clean up my mess. It looks like a chocolate factory exploded in my kitchen! This entry was posted in candy by Lorinda. Bookmark the permalink. Love truffles (well, who doesn’t), but you had me at “sometimes I like to make big messes that don’t involve flour!” Perfect way to start a truffle post! I’m still trying to figure out how I could have possibly used every bowl and utensil in the kitchen. 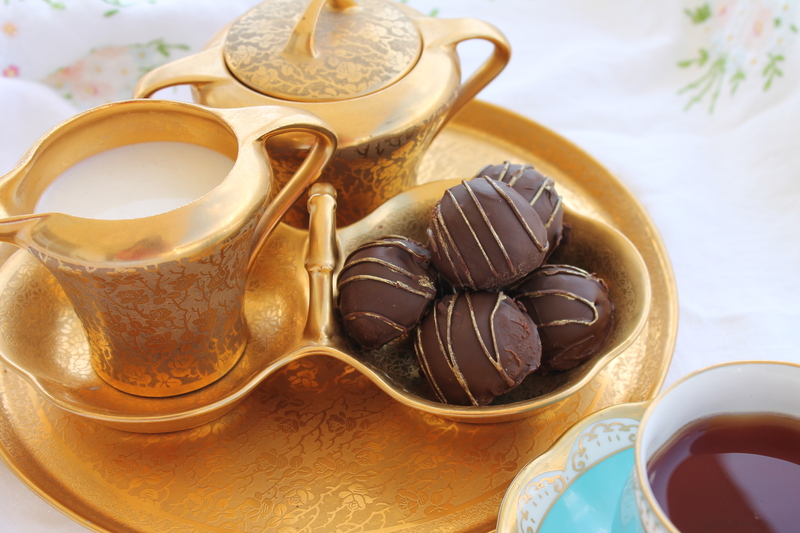 Boy oh boy, that idea of piping the truffles is brilliant! And if they taste like Frangos, double points!! Uh, have I asked you lately when you’re going to write your cookbook? The egg truffle is so cute! Not sure I could get mine to all turn out great either! I’ve included this in my Easter Sweets roundup! Thanks so much for sharing at Saturday Dishes! Thank you for sharing it! The method is sound, but an actual chocolate mold would make it a snap!